Hey I see you are here again to learn more! I can tell you now that this is very good. The fact that you’re taking your time to gather all of this info shows me that you’re a determined person. That is not only a good quality for getting waves, but that is a good quality for life in general. Please be sure to sign up for email updates so that you can receive encouraging tips from me as you progress through your journey. stroke all the way down to your hairline. The back is like the reverse of that. To get waves in the hair on the back of your head you begin at your crown, same as the top, then you continue the stroke in a downward motion until you get to the edge of your neck. If you are finding it that the back is not the easiest and is actually the most difficult for you to get, then I suggest you take a look at how much brush time you give the back. Is it the last part of your head that you brush ? Do you always skip brushing the back ? Things like that can affect the results of your waves. If you want to make quick progress, here is what you should do. You need to increase your brush time! To increase your brush time you need to brush your hair more than you normally do. If your back is a problem and isn’t waving up like you want it then you need to give it special attention. That means since your back side is weak you need to give it more brush time than your top and two sides. If you increase your brush time, as well as wolf longer, you will see results in your next two haircuts as long as you do the two things that I mentioned. The two things are increase brush time and wolf longer. 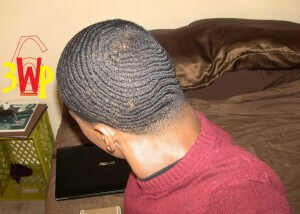 For more info about 360 waves on the back continue reading. If you want to create a custom look for your waves you can tilt your brush diagonal and brush the hair on the back of your head slightly to the left or right. Doing that will effectively alter the way your waves come out on the back. The waves on the back of your head will slant in a cool way depending on how much you tilt the brush and the angle you brush at.